This is a review of Yankee Candle wax melts from Walmart for Spring 2018. Yankee hit it out of the park with these 28 new scents! The scents are fantastic, and the throw on most of them is excellent. Walmart raised the price of these melts back up to $3.93, which is what the price was originally a few years ago. They had dropped it last year, but I suppose now that the Yankee wax melts brand at Walmart is officially called "Yankee Candle" (rather than Yankee American Home or Yankee Home Inspiration), and the scents are now regular Yankee Candle scents (rather than similar named scents), they had to raise the price. 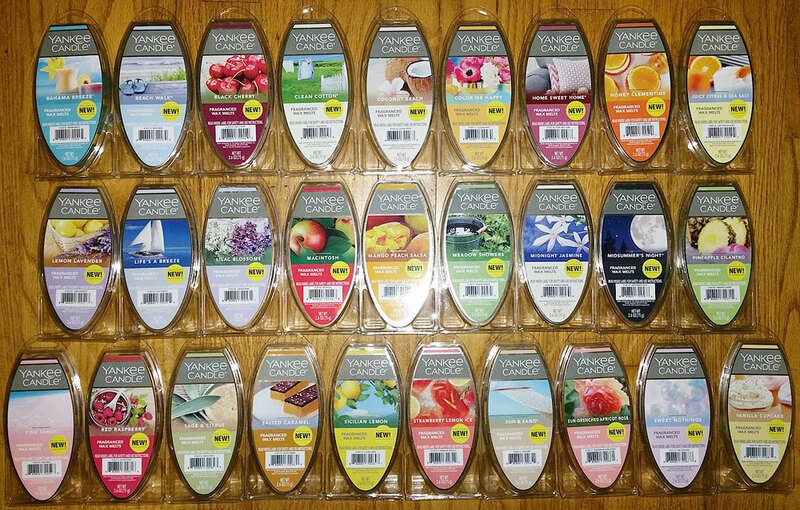 But these new scents are the best quality Yankee Candle wax melt scents yet, and with the strongest throw. So I don't mind spending a little more. I did a video review of these scents, but I only posted it in our Facebook group (not YouTube). You can view the video HERE, but you need to join our Facebook group first. Description: There's cool summer refreshment in this tropical blend of pineapple, grapefruit and mango. A mixture of tropical fruits, sweet but with a slight sour note. I detect pineapple and maybe mango and possibly peach. Looking at the scent notes, I don't smell musk or any perfumey notes at all. Description: Refreshing salt water and sea musk warmed with sunny notes of tangerine and orange blossom. A nice fresh breezy slightly salty watery scent with a smidgen of light wood. It's only slightly sweet. It's similar to a lot of other scents with this description, but I like it. Description: The absolutely delicious sweetness of rich, ripe black cherries. This is a fake cherry scent, but I love it. It's not a tart juicy black cherry. It's quite sweet and there might be a hint of vanilla, coconut or almond, but just barely detectable. It smells almost exactly like Yankee American Home Merry Cherry, but very slightly richer and darker. Looking at the scent notes, there's the almond, but I don't smell cinnamon at all. Description: Sun-dried cotton combined with green notes, white flowers and a hit of lemon. A perfect cottony scent. It's clean and sweet, probably sweeter than most similar scents. It's more of a laundry detergent scent rather than a soft powdery fabric softener. But it's not a harsh "chlorine" type laundry detergent scent like Better Homes & Gardens Line Dried Linen. It's very pleasant and I really like it. Description: A taste of the tropics - warm coconut blended with pineapple and Tahitian vanilla. This smells a little bit like ScentSationals Passion Fruit Coconut, one of my favorite scents. It smells like sweet coconut vanilla skin cream with a hint of floral. Looking at the scent notes, I think I do smell a smidgen of pineapple but it's barely noticeable. I really like this scent. I smell a combination of peach or maybe a tropical fruit, mixed with a hint of floral. The floral is kind of authentic, like an Easter lily. But the peach or tropical note has a little bit of sourness that I don't care for. Description: A heartwarming blend of cinnamon, baking spices and a hint of freshly poured tea. I'm not sure why a cinnamon scent is included with the new spring line. This smells like straight cinnamon with a sweet note. It's not a bakery cinnamon scent. Looking at the scent notes, I don't smell cherry or musk, although there is a very slightly different note way in the background that could be considered a little perfumey. I think I also detect a smidgen of apple. Description: Refreshing orange takes a sweet turn in this honey-dipped citrus delight. Oh this smells fantastic, and wow it's strong! It started taking over the house within just a few minutes before it was even completely melted. I smell lemon and tea with a little bit of orange with a slight zesty or even a tiny bit of a sour note (probably the clementine). It's not really a lemon iced tea scent though. Looking at the scent notes, I don't see tea, so it's probably the honey that I'm thinking is tea (although I don't actually smell honey). The scent lasted 2 days! TWO DAYS!! Oh this smells interesting! I smell grapefruit and a thick slightly sweet lemon curd, but the sweetness is tempered a little by a watery, slightly salty, very slightly sour note (which is the yuzu). When melted, it smells kind of like peaches, even though peach is not in the scent notes. It's different, and I kind of like it, although it has a little bit of a rich nauseating note. Description: Clean and inviting... a powdery fresh blend of tangy lemon citrus and sweet lavender flowers. A clean spa scent that smells like a combination of lavender with a little bit of orange (but not a really citrusy orange) and maybe even a hint of neroli. It's slightly sweet. Looking at the scent notes, the neroli I'm smelling is petitgrain (which is very similar). And I do smell a hint of eucalyptus in the background. I like this scent; it's unique. Description: Exhilarating and fresh, like a sea breeze on a cloudless day. A nice but typical fresh crisp scent with just a little sweetness, a hint of a cologne note, and a smidgen of a pepper note. It smells like men's body wash. Description: An alluring grove of lavender, white and deep purple lilacs. This is a nice sweet powdery lilac scent with a little bit of a soapy note, like lilac scented soap. I really like it. Description: Fruit peels, crisp greens and juicy Macintosh apples. A perfect combination of crisp apple with a caramel note. Looking at the scent notes, no caramel, so it must be the combination of clove and musk that I think is caramel. Although I don't smell clove or any perfumey notes, or grapefruit. Description: This sweet and zesty fragrance conjures juicy mangoes and peaches livened with citrus, ginger flowers and pink pepper. I love this scent! It smells like the sweet succulent juicy insides of a peach. There's a smidgen of another note in there, maybe tea or citrus? Description: Daydreaming of a quiet escape... the naturally tranquil and airy scent of fresh raindrops on blades of green grass. This really does smell like rain showers in a meadow! It's a pleasant fresh watery scent with a hint of sweetness and a green grassy note with a smidgen of floral, although it's not a floral scent. It's a little soapy, like body wash, but it's not a cologne scent either. It's similar to a lot of fresh body wash scents out there, but I like it. It smells a lot like the Beach Walk scent, but a bit sweeter and with that green grassy floral note. Description: A seductively lush perfume of water jasmine, sweet honeysuckle, neroli, and mandarin blossom. A fantastic jasmine scent with a soapy note. It's not a perfumey jasmine, as it's not overly sweet, but more like high quality jasmine scented soap. Looking at the scent notes, I don't smell grapefruit at all, but I do smell the neroli, which is one of my favorite scents. Orantique is a cross between an orange and tangerine, but I don't smell that either. Description: An intoxicating and masculine blend of musk, patchouli, sage and mahogany cologne. A classic men's cologne scent that smells a bit like Drakkar Noir. Description: A tropical treat... fresh, island pineapple served with a citrus touch of cilantro and sweet coconut. This is a sweet pineapple scent and I don't smell much else, but it's slightly different from other pineapple scents. There may be a hint of coconut, and possibly a smidgen of floral and some other fruit way in the background. I'm not a fan of pineapple scents, but I really like this one because it's very sweet, like pineapple candy. Description: It's an exotic island escape in the beautiful mix of bright citrus, sweet florals and spicy vanilla. Everyone seems to love this scent, and with good reason. It's sweet and slightly floral and smells like a luxurious body cream with a hint of honeydew melon, coconut, and vanilla, and maybe a smidgen of tropical fruit. Description: Tangy sweet and full of nature's goodness, there is nothing quite as delicious as ripe, rosy red raspberries. A nice fake raspberry scent, like a raspberry powdered drink mix. Description: This blend of earthy sage, luxurious talc and lemon-lime creates a natural harmony. This is an unusual scent. It's kind of like a spa scent but also has an industrial note, almost like a bathroom cleaner, but not in a bad way. Oh it's lavender! But there's little bit of maybe a woodsy musky note, and maybe baby powder, but it's not a delicate scent either. I do think there's a citrusy note but it's not really lemon, orange or grapefruit. It's completely different from the Lemon Lavender scent, and very hard to describe! Description: Sweet surrender is yours with the luscious aroma of burnt sugar, sea salt and smooth vanilla caramel. A fantastic rich, slightly salty caramel scent with a hint of chocolate. Looking at the scent notes, they're much more complex than this scent smells! Description: So fresh and full of zest, like a bright day exploring hillside villages with sweet unexpected turns. This smells like super sweet lemonade, or maybe lemon curd. It might have a hint of orange. It's not a bakery scent at all. I really like it. Description: Refresh your home with the cool aroma of just-picked strawberries and strips of lemon peel crisped in ice. A rich creamy strawberry scent with a zesty lemon note, like a strawberry lemon slushie. Fantastic! Description: A tropical beach breeze of sweet orange flower, lemony citrus, fresh lavender and powdery musk. Fantastic scent that smells like a combination of Coppertone suntan oil and soap. Description: A full bloom scent of lush, orange apricot and soft petals. A nice combination of slightly sour peach with slightly sweet rose. When melted, it took on more of the sour peach note than I'd like. Description: Warm, soft, sweet—like a special whisper just for you. This is a very popular new scent, and with good reason. It's fantastic! It smells like a combination of baby powder and a rich, expensive perfume. It's one of my new favorites, and perfect for a bedroom or baby's room. Description: The rich, creamy aroma of vanilla cupcakes with hints of lemon and lots of buttery icing. This smells just like a vanilla cupcake. It's sweet and vanilla cake-y with a little bit of white chocolate icing. It's not just a typical plain vanilla scent. I really like it. Looking at the scent notes, okay there's the chocolate, but it's very slight.